Learn More: Read and Write is a program that contains six different exercises aimed at learning the basics of alphabet and spelling. The lessons are given by a small animated old man. The Program is based on 300 fine illustrations for the most common words. Locks and writing exercises with the capability to create custom dictionaries with your own images. You are shown around by the little old man and sheep grazing in a glade. Crossword exercise creates a new crossword puzzle each time. Can be installed with e.g. English dictionary and English number. Recorded speech to all words supports learning. In addition, it has a utility program to customize the contents in the application. Alphabet - You can set to work with upper or lower case letters. Pair words and images with different initial letters. Three images are displayed on the screen and the words with which the images are to be paired are written longest. When you click on the word it ends up next to the picture and the word is said. Pair words and images with equal initial letter. Find hidden words - the words are hiding in a grid with letters. Picture cross - a picture crossword where the content is randomized with the selected dictionary as the basis. Spell words - three pictures on each screen that you are going to write words for. Tools - Here you can change and add glossaries, create your own glossaries, add sounds and pictures, determine the difficulty level etc. The program is very flexible. You can make many different settings such as, audio on / off, choose which exercises to show, fonts etc. Settings are saved for each user. The program can be controlled with mouse, touch screen, keyboard and one or two contacts. NOTE! There are several different language versions on the CD. You can install the entire program in English. Then it can be used to train English. 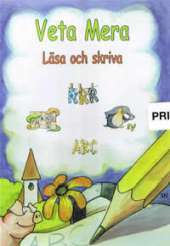 There are also language versions such as Norwegian, Danish, Finnish and Italian.